"Sanders cover errors by removing them." 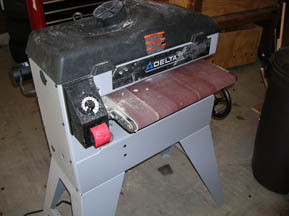 Virtually every size project will attract a sander at the right time. No matter how clean the cut, a blade can only do so much. Especially if you plan on staining, all the little scratches, flaws, saw marks, dings, and everything else you didn’t notice will get highlighted if not dealt with properly. We all know what sanding is and what it’s for. You can simply use your hands and a block for most projects, but you’ll wear yourself out if you try to sand an entire bookcase by hand. Go ahead and do it if you have the time and inclination. We’re rooting for you all the way. There are more efficient ways. 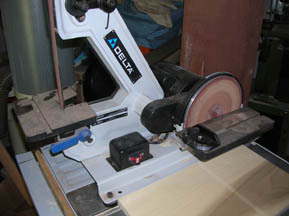 We use a bench top disk sander for simple shaping of pieces. It can do some quick work and ruin your piece when fed incorrectly. Make sure to get one with a heavy base to reduce vibration. Take your time, move in slow, be ready to pull away if the action gets too aggressive. Always use the downward rotation side. Our machine has a 1-inch belt attachment that we thought would get more use than it does. We’ve found the belt to be one of those “cool when you find a need” tools. But overall, it’s not something we’d go out of our way for. 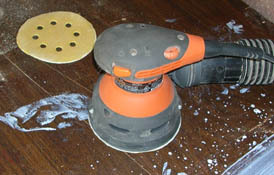 A random orbit sander can be had in 4-, 5-, 6-inch versions. Most have dust collection holes in the pad and can accept either hook & loop (why don’t they just call it Velcro?) or self-adhesive pads. A vacuum port will keep you from breathing in too much dust. We recently bought a 5-inch Ridgid and use it a lot. Buy a few boxes of pads ranging from 100 to 220 grit. Make sure you get the right diameter, number of hole openings for your brand, and that your vacuum hose will fit. The random orbit action keeps scratches to a bare minimum. The weight of the machine is sufficient to produce good results, no need to press down hard at all. And it works better with the vacuum attached. Finish machines, in our experience, produce more dust than results and we prefer to leave ours turned off. Oh, we used it for several years. Right up until we got a random orbiter. There a lot of other tools designed to sand into and around corners and everywhere else you can think of. Until shown otherwise, we'll leave them on the gimmick aisle. Hand held belt sanders are useful when cleaning up a mismatched edge, clearing some rough spots, or grinding down a slightly oversize piece. But they are hungry, torquey, and easy to get off square. We use ours regularly, with great caution. Our latest addition is of the floor standing drum variety. We’ve not done much more than set it up and can already see that this power tool will require a steeper learning curve than the others we’ve bought. Still, the thought of being able to smooth an entire board in one fell swoop appeals to us. Well, that and the fact that our local supplier had a 20% off sale that weekend.